Two separate displays sitting side-by-side can only mean one thing: a win-win situation. The DST940 from Peerless-AV mounts two displays on the same plane resulting in exceptional alignment. Behind the displays, a long plate spans both and the displays are attached with easy-glide brackets to ensure secured placement and ease of adjustability. Installation and adjustment has never been easier, because both displays slide horizontally and tilt up to 20 degrees to ensure the message is placed at its ideal viewing angle. This makes this mounting solution perfect for restaurant menu signage, airport flight information displays or entertainment and department store applications. 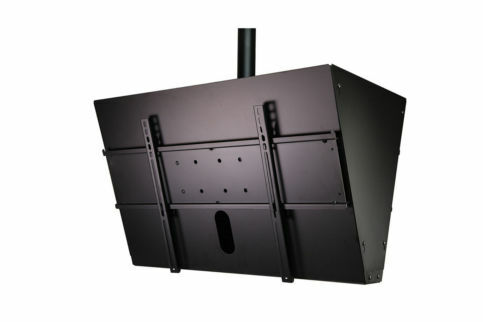 We have no downloads available for the Peerless Back to Back Ceiling Display mount For 40-65 inch at this time.